Abstract: Taking into consideration the popularity of small formfactor PC's, 'combo drives' are the perfect match for space lacking cases such as those tiny toaster-sized PCs. Taking into consideration the popularity of small formfactor PC's, 'combo drives' are the perfect match for space lacking cases such as those tiny toaster-sized PCs. After all, Small Form Factor contraptions generally only have one useable 5.25" drive bay, and if they do have two, using multiple CD-ROMs would just be a waste of valuable 5.15" bay real estate. The flexibility to read both DVD-ROM's and burn CD-R/RW discs with just one drive is really nice, and so in this review PCstats will be testing the new MSI X48 combo drive to see how it fairs with each of these tasks. 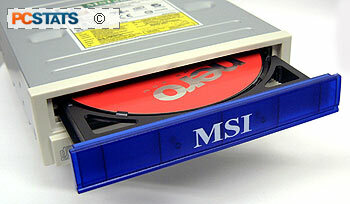 The MSI X48 is capable of burning CD-R media at 48x, CD-RW media at 24x, reading CD's at 48x, and reading DVD-ROM's at 16x. Users of smaller/SFF PC's will be happy to hear that the MSI X48 is only 17CM in length, making for a nice and compact package. Along with what could already be considered a compelling feature set, the MSI X48 includes two interchangeable face plates which allow you to match the colour of the drive with your case. Whether you have a regular white case or a fancy black one, the MSI X48 drive can suite your style. 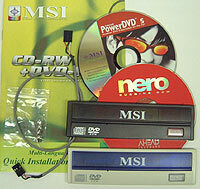 Topping things off, the MSI X48 Combo drive also include a full copy of PowerDVD 5, and Nero burning ROM! Installation Guide, Audio Cable, Four Mounting Screws, Nero Express, Interchangeable face plates. The X48 drive looks pretty good doesn't it? The large clear plastic button functions not just as an eject button but it also tells the user what type of media is in the drive, and what the X48 combo drive is doing. When a DVD is in the drive the button will be light blue. When the disc is being accessed, the LED will flash. When a CD is in the drive, the eject button on the MSI X48 will shine a darker blue, and flash when the CD is being read. When writing onto a CD-RW, the LED will flash green. As you can see, the MSI X48 comes with both a white/blue front as well as a black bezel. It supports TAO (Track at Once), DAO (Disc at Once), SAO (Session at Once), Multisession, Packet Write and Mt. Rainier Write writing methods. To manage buffer underrun errors, the X48 makes use of 'SuperLink' technology - which goes by several different names depending on the manufacturer - that essentially just stops your discs from becoming CD coasters. The MSI X48 drive can be mounted both horizontally or vertically thanks to the clips on the CD tray, and packs in the following connectors at the rear; digital Audio output, analog audio output, Master/Slave/Cable Select jumpers, IDE connector, and the Molex power connector.